Aleksandra Novikova, PhD has been working on energy and climate policy since 1999. She focuses on the design of circular economy, energy system modeling, the evaluation of energy efficiency and climate mitigation policy, and financing climate actions. She has conducted research, capacity building, evaluation, and/or training projects for the European Commission, UNDP, ClimateWorks, Climate Policy Initiative, a few governmental bodies of the countries of Europe, America, and Asia, as well as other national and international organizations. At present, she is supervising the projects related to policy and financing of low carbon transformation of human shelter and services delivered within it. Aleksandra holds an MSc and PhD in Environmental Sciences and Policy from Central European University (Hungary) and a BSc in Mathematical Economics from Novosibirsk State University (Russia). She has also been a research scholar at the Lawrence Berkeley National Laboratory in California. 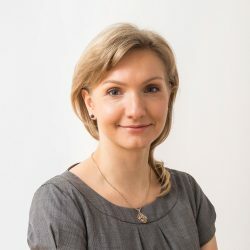 Aleksandra has published and co-authored almost fifty publications, among which she was a Lead Author of the 4th Assessment Report of the Nobel-prize winning Intergovernmental Panel on Climate Change (IPCC) and a Lead Analyst of the Global Energy Assessment (GEA). She has served as a member of the Planning Committee of the International Energy Policy & Programme Evaluation Conference since 2011 and will co-chair this event in 2018. Neuhoff, Karsten; Amecke, Hermann; Novikova, Aleksandra; Stelmakh, Kateryna: Energetische Sanierung: Handlungsbedarf auf vielen Ebenen, DIW Wochenbericht 34 / 2011, S. 2 ff. Hoogwijk, Monique; de la Rue du Can, Stephane; Novikova, Aleksandra; Ürge-Vorsatz, Diana; Blomen, Eliane; Blok, Kornelis: Assessment of bottom-up sectoral and regional mitigation potentials, Energy Policy 2010, S. 3044 ff. Ürge-Vorsatz, Diana; Novikova, Aleksandra; Koeppel, Sonja; Boza-Kiss, Benigna: Bottom–up assessment of potentials and costs of CO2 emission mitigation in the buildings sector: insights into the missing elements, Energy Efficiency 2009, S. 293 ff. Ürge-Vorsatz, Diana; Novikova, Aleksandra: Potentials and Costs of Carbon Dioxide Mitigation in the World’s Buildings, Energy Policy 2008, S. 642 ff. Ürge-Vorsatz, Diana; Novikova, Aleksandra; Watt, Alan: Kyoto Flexibility Mechanisms in an enlarged EU: will they make a difference?, Climate Policy 2007, S. 179 ff. Novikova, Aleksandra; Timoshyna, Anastasia: Roadmapping Kyoto: energy efficiency in Russia and Ukraine, Proceedings of the Summer Academy “Energy and the Environment”: Implementing the Kyoto Protocol Chances and Challenges for Transition Countries, Lexxion, Berlin, 2007.